I was going to post this record in July, when the Pikes Peak or Bust Rodeo was going on--but I forgot. However, since there's a rodeo going on in Colorado practically every weekend, from now through September, I figure I'm still good to go on this little gem. In the mid to late 1950s, little Jeannie Bradway performed with her parents, Bill and Jean, as the Harvest Time Trio. 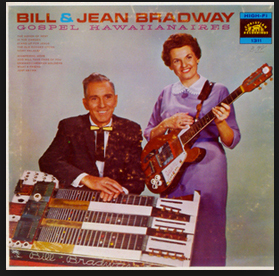 Yes, we are talking about the same Bill and Jean Bradway, "King and Queen of the Silver Strings," who would go on to record the fantastic Gospel Hawaiianaires LP (1965). Bill and Jean were channeling Les Paul and Mary Ford, when they added little Jeannie to the act. 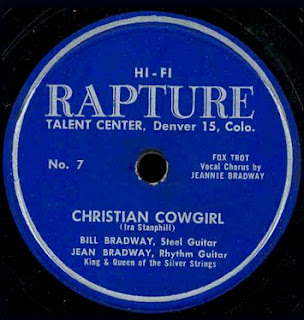 Around this time the couple started up the Rapture Talent Center record label, out of Denver.